January 20th I posted the design wall and I haven’t had anything to say since! 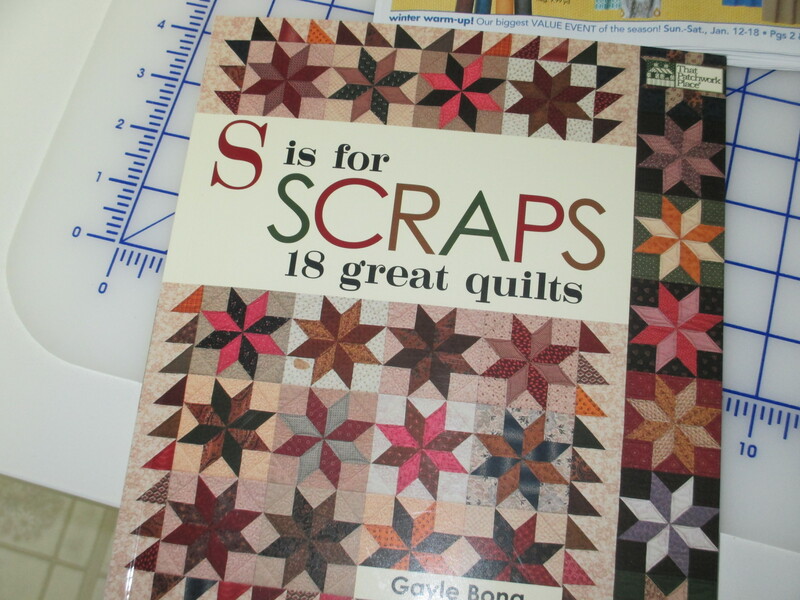 I pretty much lost the mojo for quilting and without that I don’t have much to say on a quilting blog. It all started ( or ended, depending on which way you look at it) when my ULT2002D (my 12-year-old wonderful embroidery machine) had some mechanical problems. This is not a “daily driver”. I use this machine a few times a season so I wasn’t ready to let embroidery capabilities go. The dealer is about an hour away so off we went for a repair and came home with a new machine and a desire to justify the purchase. I’ve had some interesting times learning all of the new buttons and gizmos. 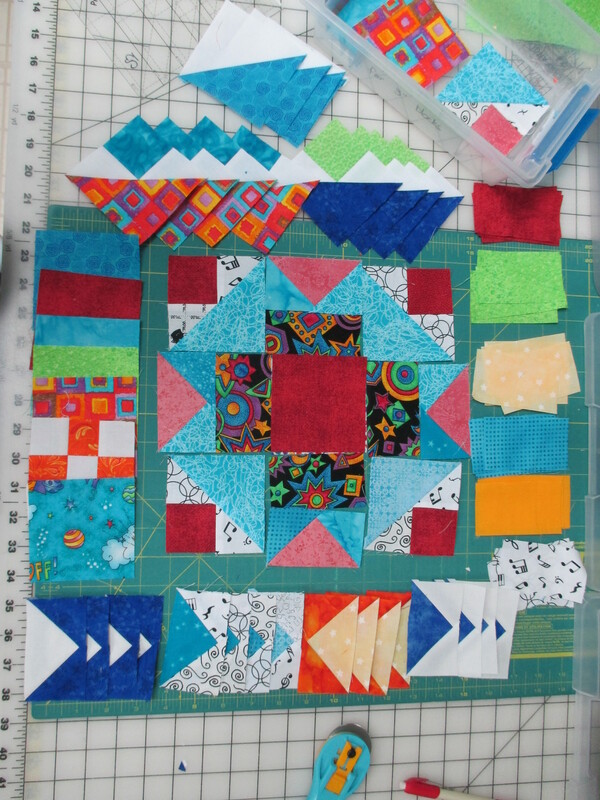 At some point I want to incorporate all some of my sample stitch outs into quilt blocks…..maybe that will jump-start quilting again. But for now I am playing with my pretty threads, stitching out flowers and Winnie the Pooh as well as kitchen scenes and sewing saying on shirts. I’ve done some lace and a couple of the new to me In the Hoop projects. I’ve had a lot of fun and a little frustration. This machine is awesome. Our weather is finally warming. 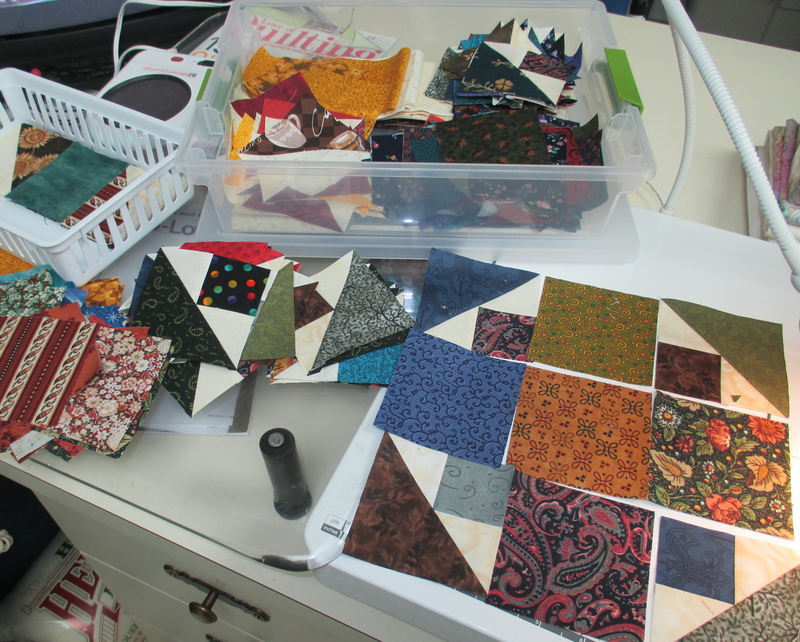 I’ve been in the sun room working on the long arm so perhaps a finished quilt is not too far in my future….then I’ll have something to report on Sunday’s Stash Report! Most of my weekend was spent assembling blocks and watching football. 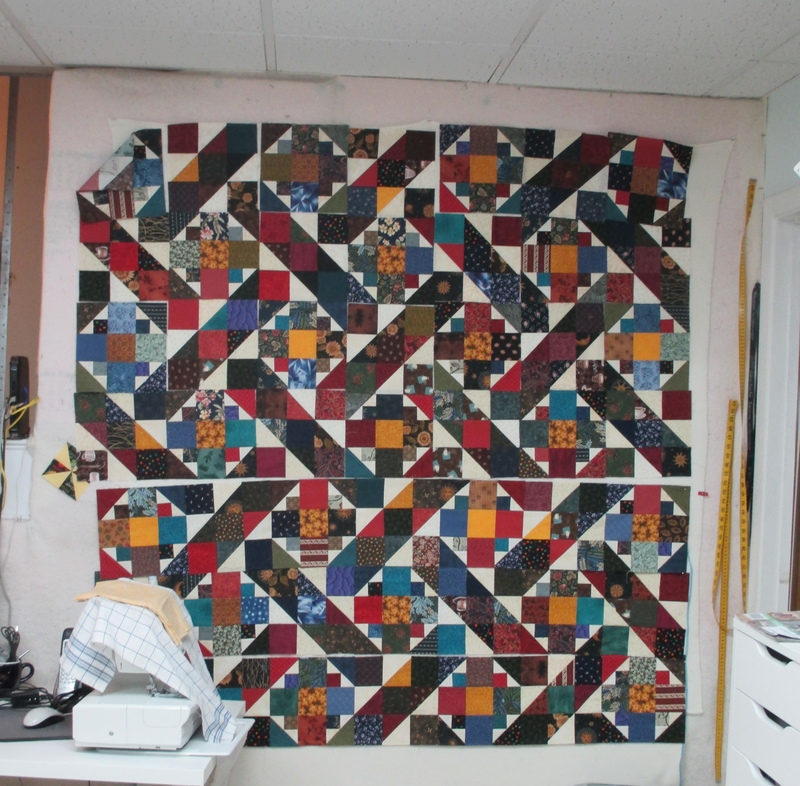 The blocks are all scrappy and from the 3 1/2 inch strip bin. This is not my normal size as I really like 2 1/2 inch strips…and now I remember why. If the fabric is ugly not a favorite it needs to be cut smaller. 3 1/2 is a pretty big chunk. And my bin of 3 1/2 strips is pretty picked over…..there are a lot of uglies unfavorable pieces in this bin! 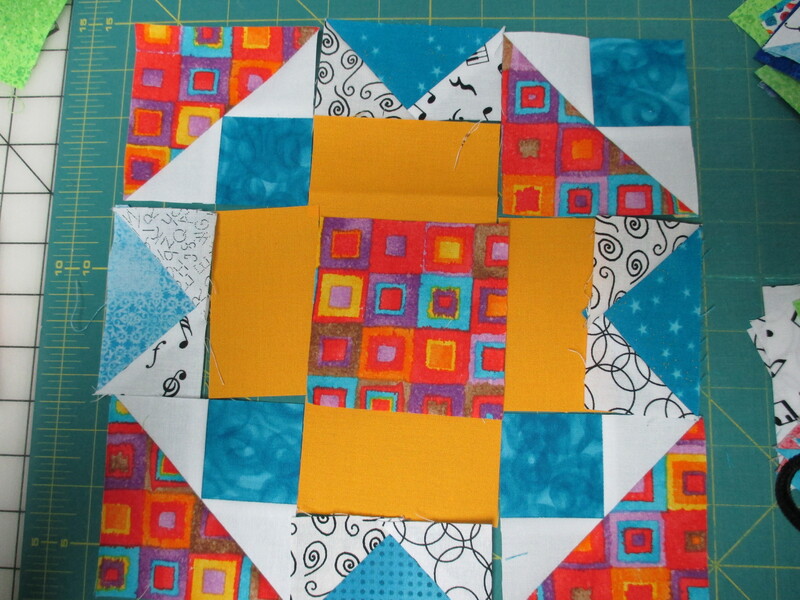 I really like making shaded 4 patch blocks. 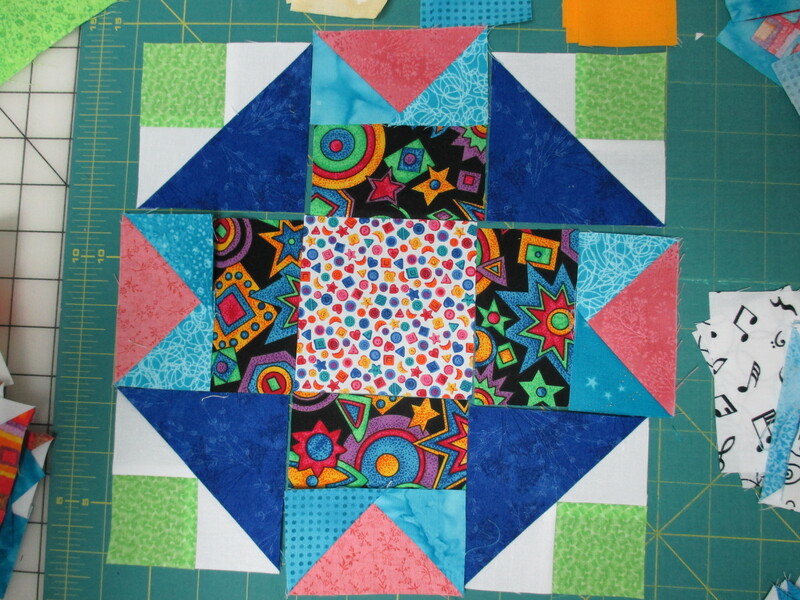 Judy’s scrap block this month got me started and this pattern seemed to be the best use of my scraps using that shaded 4 patch. Here’s what I’ve gotten up on the wall so far. I’m going bigger than the 60 inches in Gayle’s book. My plan is to use up most of this bin and end up about 90 inches. 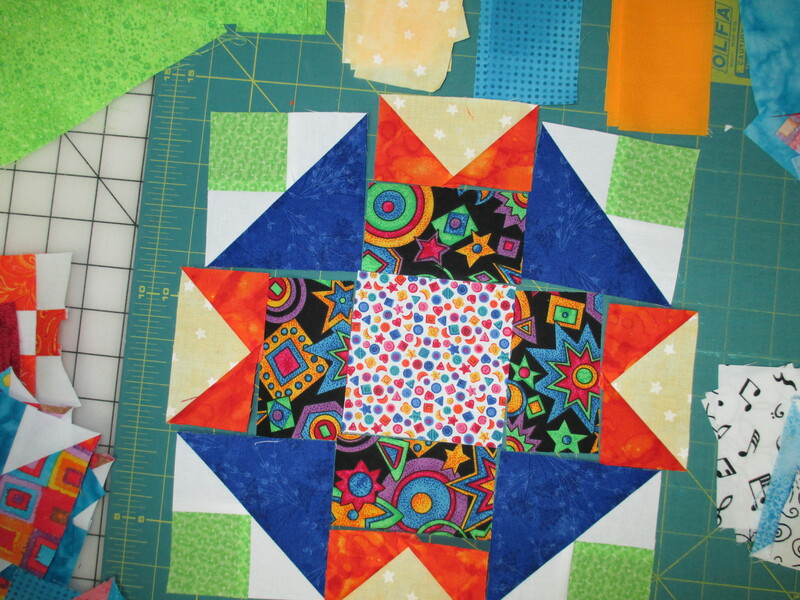 So far it is going together pretty quickly….as long as I don’t study the fabric or be too choosy. Let’s go to Patchwork Times and see what’s going up on other design walls. Well, the zero is gone. At least from the fabric acquired column. My first purchase from Mo * arrived this week. Not a big purchase just one little charm pack or 2/3 yd. 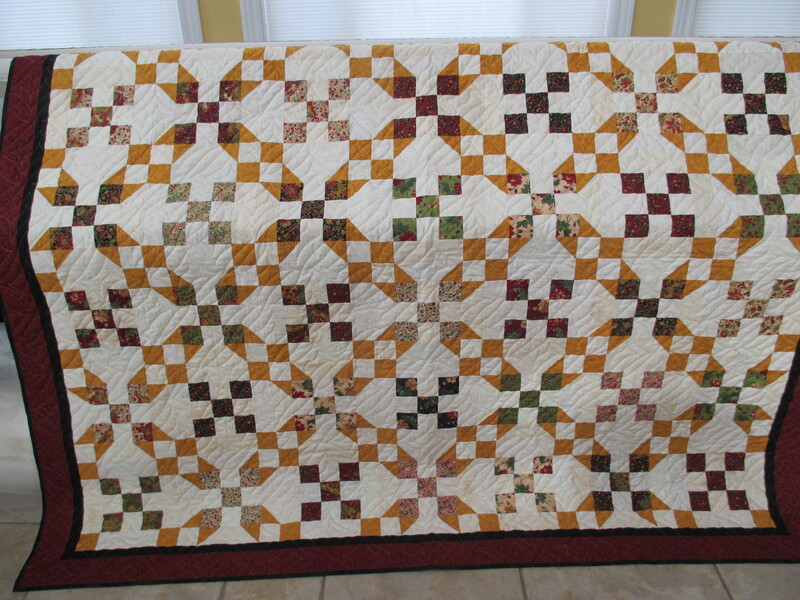 I have a quilt near completion but not finished yet! I’ve been playing with a scrap block. 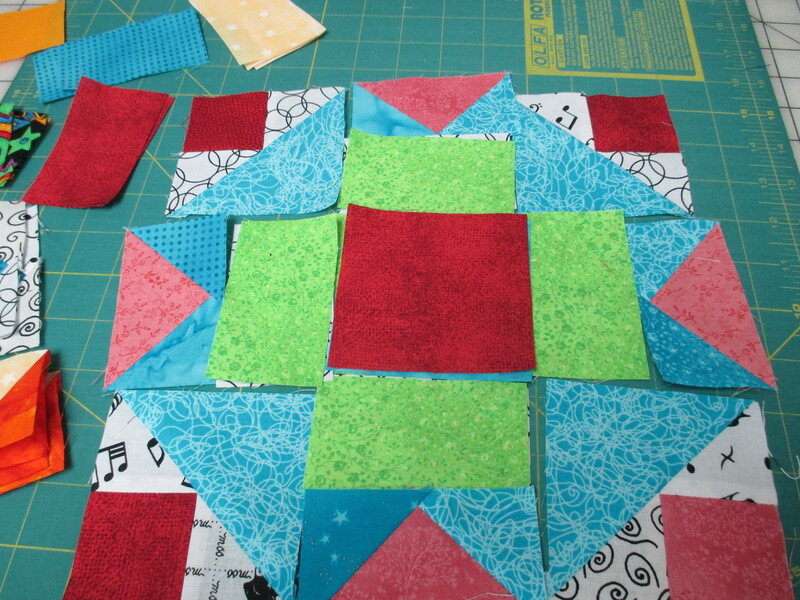 Judy at Patchwork Times is hosting a Scrap Challenge and I’ve been playing with the block. Turns out I already had a small collection of parts leftover from a couple of other projects. 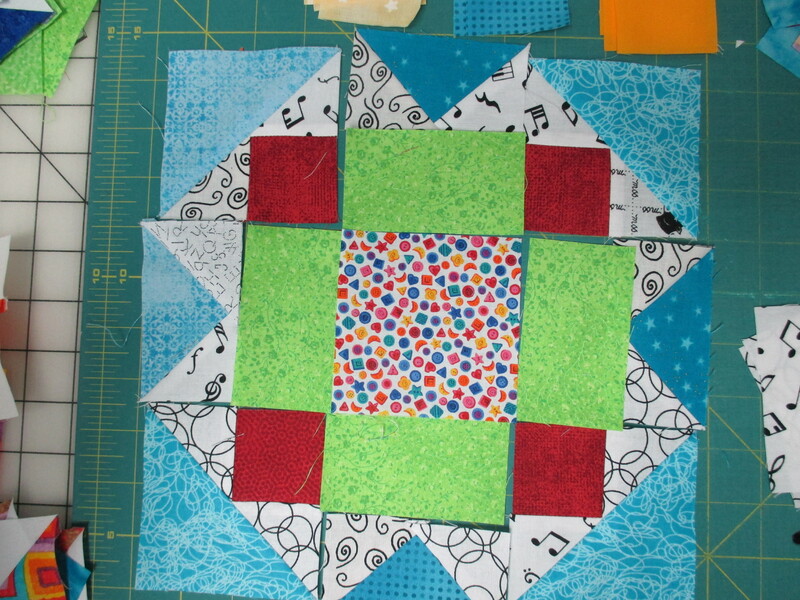 This block is a 9 patch that will finish at 9 inches…..if I stitch it together. I just keep switching out the patches. This one has parts leftover from Easy Street the Bonnie Hunter mystery finished in 2013. Then I add and subtracted and got this….. I turned the corner block, too. Next, some more color added. 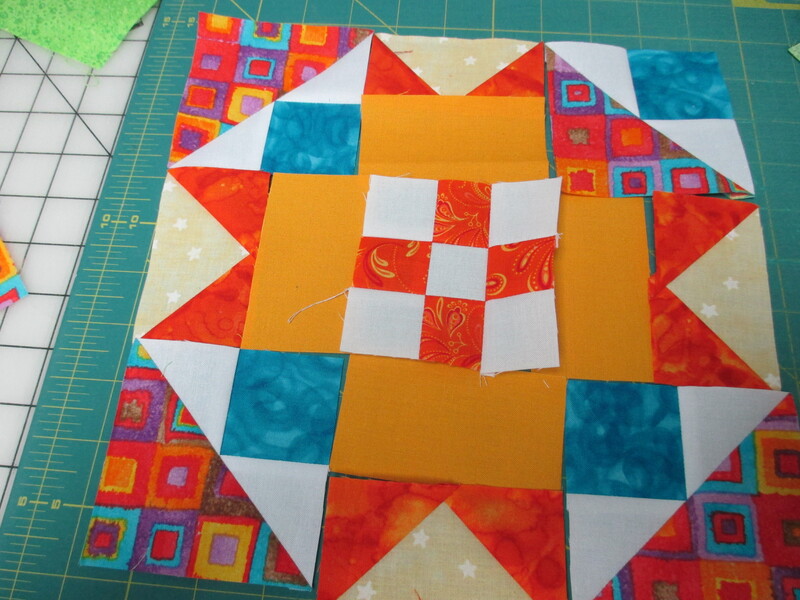 Bright but subdued, these are leftover from a Project Linus quilt. Those orange bricks just really pop…too much? Back to the drawing board…..
To see what is going on at Patchwork Times click here. This is going to be too easy….nothing in, nothing out! 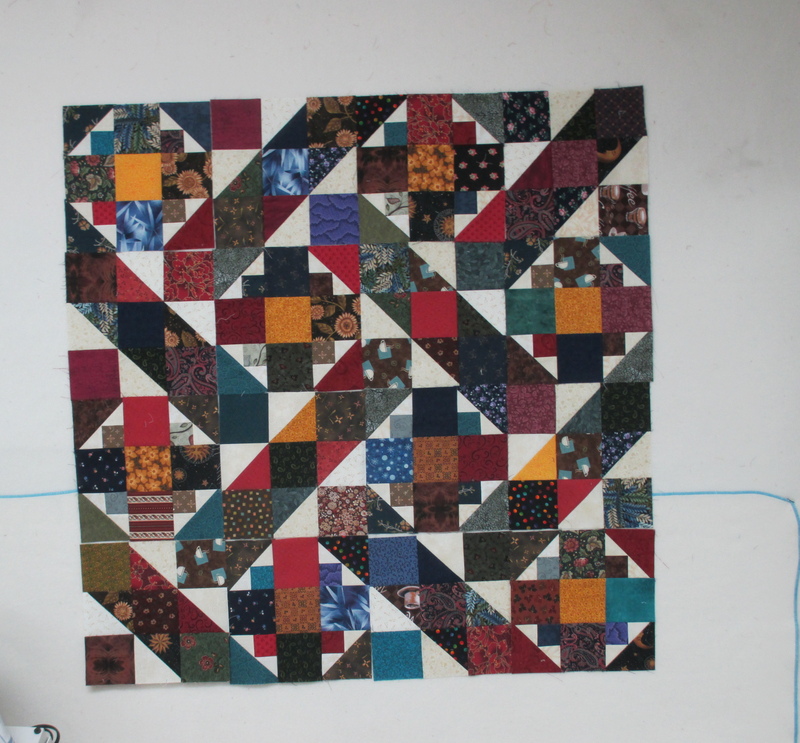 I am hoping to get a quilt finished before I go to the LQS. And I am almost afraid to open any e-mail from Mo*. My plan for 2014 is to use at least 200 yards, from stash of course, but is unrealistic to believe I will not “freshen” the stash. I really love that term. Makes it sound like falling off the wagon was planned. I plan to only buy when necessary, and then in reasonable amounts. I hope the words”Sure, I’ll take what’s left on the bolt” never comes out of my mouth…unless it really is the end of the bolt! Year to date…..0 too easy!! Let’s go to Judy’s for an explanation of the Stash Report and to see how everyone else is doing!